Minnie Driver is the only recognised name in Marc Evans' musical drama HUNKY DORY. Welsh director Marc Evans (SNOWCAKE, MY LITTLE EYE) bravely takes on a "concept" film with his new musical coming-of-age flick, HUNKY DORY. 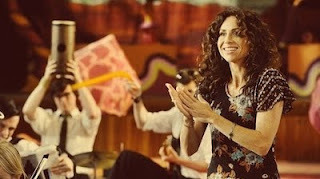 Minnie Driver (with impeccable Welsh accent) plays a teacher in a Welsh school, putting on a musical version of Shakespeare's The Tempest that incorporates the popular music of 1976 - David Bowie, Nick Drake, The Beach Boys - the year in which the movie is set. And while Driver is the only recognised name actor, she's actually not the person carrying the film. Rather, the young cast of talented kids steal the show, with the lead schoolboy Aneurin Barnard making an impressive debut. I found the movie earnest, joyful, but uneven and unsure of what it wanted to be. French writer Laurence Coriat (WONDERLAND) has penned a script that isn't an out-and-out big dance number musical in the manner of GLEE or HIGH SCHOOL MUSICAL. Indeed, it seems to want to be one of those authentic realist teen flicks of the US indie movement - AMERICAN GRAFFITI or DAZED AND CONFUSED. And even then it can't resist one of those plot devices that seems totally out of scale with all that preceded it - stupidly clumsy deus ex machina. Combining social realism and musical numbers is a hard trick to pull off, and HUNKY DORY is no BILLY ELLIOT. HUNKY DORY had its world premiere at London 2011 and has no commercial release date yet.